In November of 1983 I went to Comdex looking for business. Starting with Data Systems I had been doing disk controllers and that continued with some of the new PC add-on companies. I got a call from Tony Radman, VP of engineering at IOMEGA Corporation, could I meet him in a couple of weeks at Comdex. I said yes. IOMEGA made one of the first removable storage devices for the PC, the Bernoulli disk. They had developed an interface and software in house, but were having a lot of trouble. Most his engineers were disk drive designers, not system designers. They needed help, could we help them? Tony needed a new interface to the PC, and also the Apple Mac which was just announced. IOMEGA was using a new peripheral interface called Small Computer Systems Interface or SCSI. We had done some work with this interface and its predecessor, SASI, so I knew what we were getting into. This was a big assignment because we would take over the entire system interface job, software, firmware, and hardware. I said yes, and thus started a four year relationship with IOMEGA and Tony that would last until I established Future Domain and stopped doing consulting work. 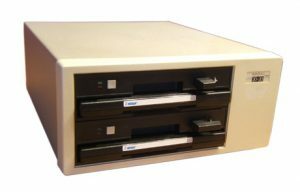 At that same Comdex I visited a company called GBT, which made printer controllers for IBM minicomputers (System 34, 36 and 38). They were actually located in Irvine, so it seemed funny that I came all the way to Las Vegas to meet them, but that’s the industry. GBT wanted to break into the display terminal business for IBM minicomputers, but did not have the expertise. GBT agreed to meet with me in early 1984 after we returned from COMDEX. In 1984 I hired two more engineers, and in the summer we had interns from MIT working for us.